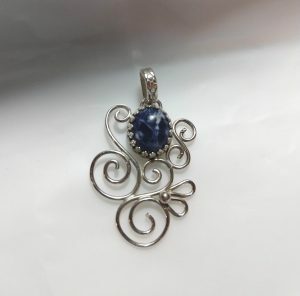 The fun technique of water etching will be introduced to enhance a basic pendant. 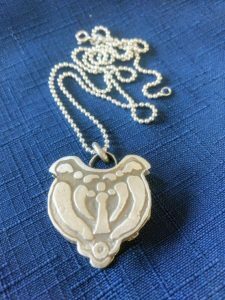 We will design a pendant shape and incorporate a design from a stencil or drawn freehand. Nail polish will be added to the parts of the design to remain elevated. After the polish and the piece are dried, we will use water to etch away the recessed spaces. A jump ring will be made to attach to your pendant for hanging on a chain. The pendant will be dried to the leather hard stage, smoothed and fired. After firing, the pendant will be polished and ready for a chain. Tools Required: Magnifying glasses, light source, wire working tools, chain for the pendant (I will have some available for purchase). have it, some will be provided. Explore prismatic Right Angle Weave. Create a delightful two-sided focal piece while exploring cubic and prismatic RAW. This double-sided pendant can be made with a variety of bead types, although class kits will include exclusively size 6/o seed beads. More info in the attached Class Description Sheet. 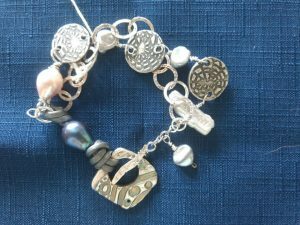 A workshop designed to make toggle clasps of your own that can be added to bracelets of your design. 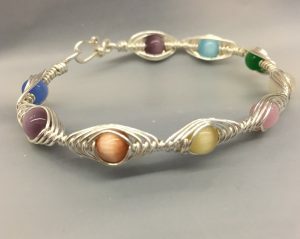 Why make nice beads and beaded pieces and use an ordinary purchased clasp when you can make an original and unique one? We will make the clasp and charms, dry to the leather hard stage, smooth and torch fire the charms, and kiln fire the clasp. While the kiln is firing, we will assemble the charms and bracelet elements. Basic techniques including rolling, texturing, shaping, cutting, forming, and finishing will be used. 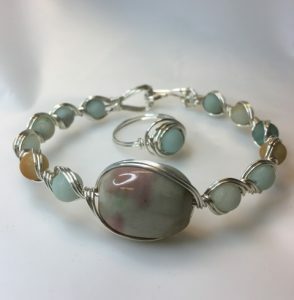 Students will construct the bracelet and add the clasp after firing. Tools Required: Magnifying glasses, light source, wire working tools, special beads or charms you may want to use. Create a unique new look for copper enamel designs by drawing with graphite pencils directly onto fired glass enamel surfaces and color with special enamel paints. 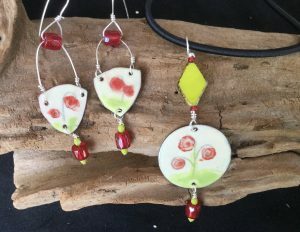 Students will learn the technique step-by-step to create small scale art pieces that will be incorporated into jewelry. Drawing skills not necessary, as templates and stencils will be available. All metal experience levels welcome. Students will use two sizes of pearls, bicones and size 11 seed beads to create a beautiful pearl bracelet. 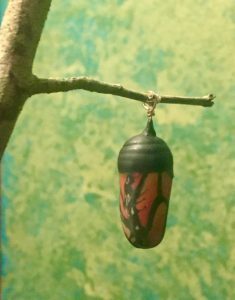 Students will make a very realistic Monarch cocoon in polymer clay while learning to develop techniques with translucent clay. Monarch cane will be provided in your kit. 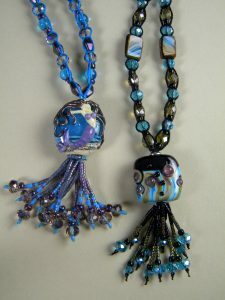 Create a stunning necklace using simple macrame knotting and fringing to complement Meredith’s lampwork glass focal bead. This wonderful technique may be used to transform a myriad of materials into beautiful jewelry. You’ll be amazed at how great that” bead soup” of yours can look. 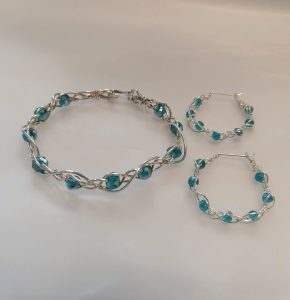 Kits are required and include : focal bead, lots of glass beads for the necklace, seed beads for fringe, findings and cotton and linen stringing materials. Additional kits will be available. 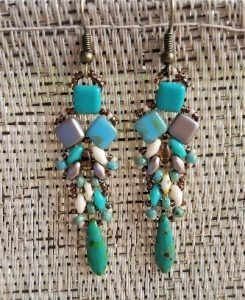 This earring tutorial uses Czechmate tile, superduo, dagger, and Miyuki seed beads to create delicate yet striking drop earrings in a unique pattern. They go equally well with jeans or that little black dress. 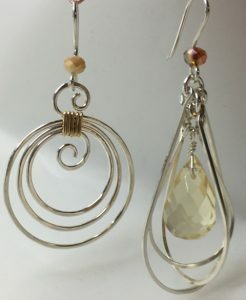 The finished length is 2 inches/5 cm (not including ear wire) and 5/8 inch at widest point. 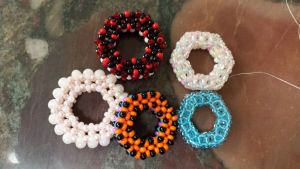 The skill level is intermediate beginner with some experience in basic bead weaving. You will be able to complete one or both earrings during the class. Tools Required: Please bring a task lamp, sharp scissors, and any vision enhancement devices you usually use when crafting or beading. You may wish to bring a work surface, although this is not essential. 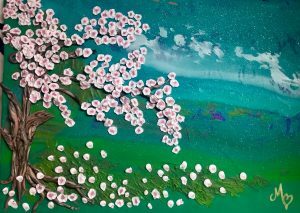 Student will make a cherry blossom miniature with polymer clay. We’ll learn blending color and texture require for painting with clay . 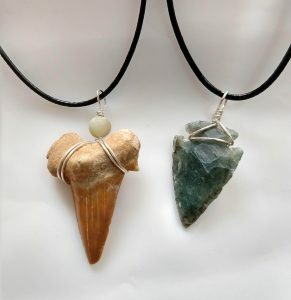 Looking for a new jewelry technique? Discover the ancient craft of enameling – the fusion of glass, copper and fire. 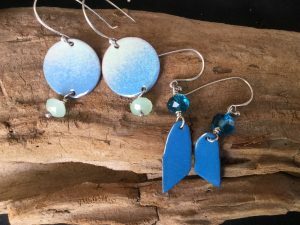 In this hands-on workshop, you will learn how to enamel onto copper, using powdered enamels and create unique and fun earrings. All metal experience levels welcome. 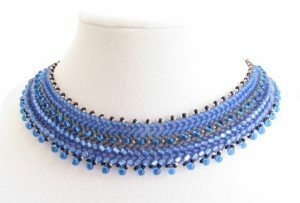 Uses size 8-0 and 6-0 seed beads to create a perfectly curved collar that is embellished with 11-0 seed beads and drops/daggers. The look can go from casual to elegant based on choice of bead colors/finishes. 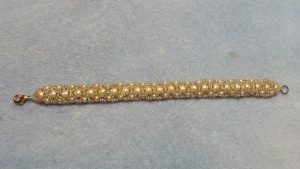 The finished length is 12.5 inches long and one inch wide with a 2-inch extender and lobster clasp. 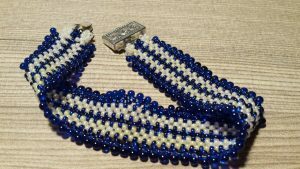 The skill level is intermediate beginner with some experience in basic bead weaving. You do not need to already know herringbone stitch. 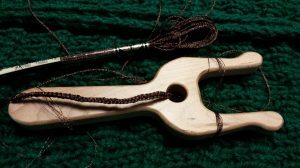 You will be able to complete at least half the necklace during the class and will be taught how to finish it. Take a walk on the ‘Wild Side’…a class devoted to Nature. 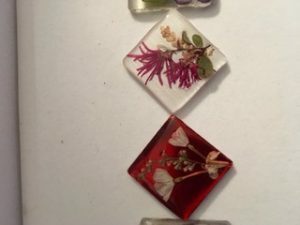 After an introduction to collecting flowers and Roadside Lovies, the different drying processes, and making Resin Jewelry (several methods), you will make and take home 2 completed Jewelry pieces that can be used for a necklace, earrings, pin/broach, or handbag ‘dangles.’ (Jewelry findings are not included.) We will be working with medium sized flowers, leaves, grasses, and embellishments. PLEASE bring the glasses or magnifying things you use to make jewelry. 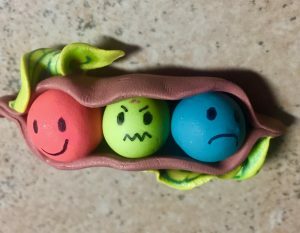 You won’t be wearing them all the time during the class, but you will need them. Also, a light source to see true colors. We have the electrical connections if you need a plug. Learn a Brand-New Stitch! 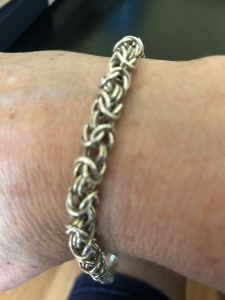 Make an elegant, bracelet featuring an exciting new off-loom stitch. Never before published, be one of the first to learn this stich. Easy to master, versatile, with a luscious drape and attractive texture, it will become your new favorite go-to stitch.